The corporate environment that we currently operate in is very challenging. In order to survive businesses need to be efficient and effective on all levels. To address some of these issues the Law Society of Northern Ireland, in a joint initiative with the Bar Library, has organised a series of events as part of the Women in the Law initiative. 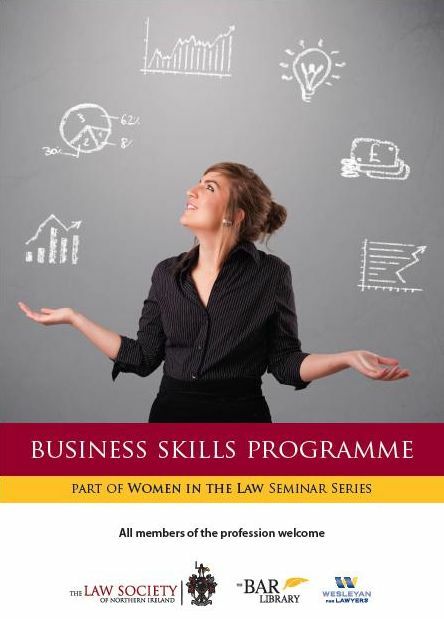 The Business Skills Programme will run over four sessions. Delegates are encouraged to attend all four sessions, however, the events can also be attended on a standalone basis. Attendance at these seminars will fully cover the 2013 Client Care and Practice Management CPD requirement. Places will be limited to 100 so early booking is advisable. 3 Client Care and Practice Management hours per session.